What was once an active night scene is now a memorial for 49 victims. 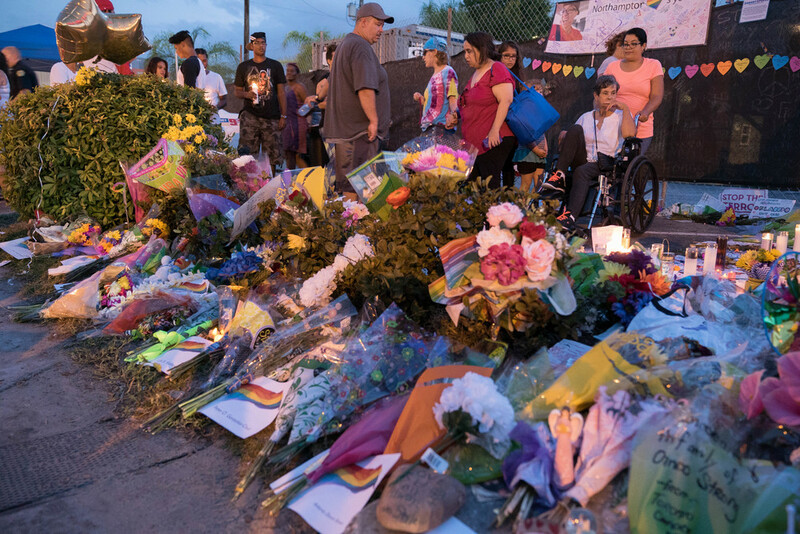 There was overwhelming sadness in Orlando outside the Pulse night club in Florida. Tonight, I saw parents crying, brothers and sisters shaking almost uncontrollably, visitors walking quietly in disbelief and others unsure of how to act or react. It appeared as if some visitors have been to the scene of the terrifying massacre every night for the past two weeks. While mourners stopped to pray together, complete strangers would walk up to someone crying and place their arms around them in comfort. This was true of those who may have been gay, straight, white, black, Hispanic or other. Everyone was truly holding each other together. Officers respectfully stood to the side carefully watching over the area, which is still an active crime scene. A large chain link fence covered in black canvas surrounds the outside walls of the club that stands silent tonight and likely permanently.